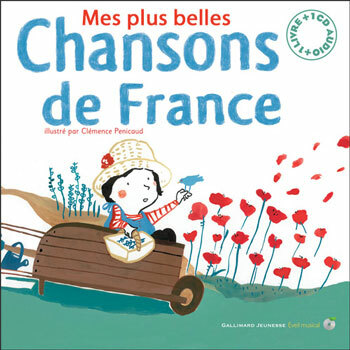 Mes Plus Belles Chansons de France is a collection of 17 well-known French children's songs. 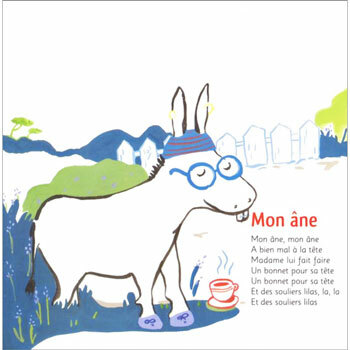 Presented as a sturdy board book and CD pack, this would make a wonderful gift for a young child, whether a native French speaker or not. The book itself features the lyrics to all of the songs, accompanied by colourful illustrations. The accompanying CD features all of the songs sung by French children and adult males, followed by instrumental tracks for karaoke sessions. Mes Plus Belles Chansons de France is published in France and is aimed at French children aged 2 - 6. It would be equally suitable for young French learners of all ages as it is very beneficial to listen to the sounds and intonation of a foreign language, even if understanding the exact words is a little difficult. I am a Canadian who purchased this book for a Great-Great-Nephew just born in Oxford. His mom and dad, both Drs in Science want him to be bilingual. It is very difficult to purchase a book unseen but I had a good feeling about this. I was right as they seem to be quite taken with the book and read to him everyday. Wonderful songs and music. My grandaughter immediately responded to it. We are British but live in France and were delighted to find Little Linguist on line - we were thus able to send a suitable book to our grandson in London for his first birthday. Our ex-language senior teacher daughter reports that it is excellent - and popular with our grandson! We can report that we found your service efficient and easy to use. Il fait comment le caméléon?